We all have plenty to say about the little chap so here's his own thread. He was very unlucky that year too, see for yourself. The other alternate championships are definetely worth reading. tbh I don't like that hypotheszing stuff. All a bit pointless. And yet Hamilton took the WDC. Which is true, but I find them interesting to read, which is why I posted it. Last year at Ferrari I think, unless he improve dramatically! Or against a weaker team mate? I think if Massa really out performed his team mate that driver will be replaced. I dont think any team will feel comfortable using Massa as a bench mark. If rumor of Webber to Ferrari next year is true and some flunky to red Bull..where is Massa going? Memo to all drivers: Fernando Alonso is NUMBER 1(ONE) at Ferrari. Santander says so, so why would Web play second fiddle willingly this late in his career. He plays second fiddle unwittingly at RB. I say Massa and Rosberg at the Silver cars...and screw Alonso mind games. I really only see two options, Sauber or Williams. If Senna and Maldonado continue to perform, I doubt it. Also, with Gutteriez waiting at Sauber... Its going to be hard for Felipe to get a seat. He has to perform this year and I think after Bahrain, his confidence is up. He needs to continue to gain confidence because a confident Massa is going to be a bit harder to beat. Confidence breeds speed for him, its like this for any other driver. I've liked him then and I still do now. He's my favorite and I hope his career continues because I think he has plenty to offer other teams. Still, he needs to continue to progress. I want to see podiums and even a possible victory this year from him this season. He needs it, lets go Felipe baby! Massa could stay at Ferrari. As another forgotten test driver, unless he is willing to take a huge pay cut and bring some sponsers to Caterham although I dont know which sponser would follow. Perhaps Mcdonalds? At least in the Caterham he will still be used to seeing the back of the Rosso's/Force Indias/Saubers and any other car that may not hit the top 10. I want to see Webber in that seat! Hockenheim is a good track for Massa, he has finished on the podium in his last three races there. It really is a race against time for Felipe, he needs to start raking in the WDC points to secure his drive for next season. If Räikkönen can't win tomorrow, I hope it's Felipe. I'm so glad I opted to support the underdog this season - GO FELIPE!!!!!!!!!!!!!!!!!!!!!!!!!! he has certainly upped his game of late. lets hope between him and Fernando they can get a Ferrari a WCC. And out qualifying Fred yet again , hope he gets another good start and can at least finish on podium. He was hard done by in strategy last race so hoping this is better for Malaysia. Saying that Malaysia is a good track for Felipe. Watch out as Massa is more than capable of winning this race. Ferrari will let them race but not touch. Having a 1 2 sweep this weekend would be superb. And put the fear of God into RB, Lotus and the rest. Hold tight, Philip Massa. Your time. Congrats Felipe. 1st row... Well done. Unlikely finish ahead of Fernando because "they" will find a way to trade driver places. I hope for a Kimi win and Felipe for second place! Alonso will out race him I think you meant. This crap gets so old. I guess there are no such things as neutral fans anymore. The race will be good except if they let him "show what he can" with old tyres, like in the last race. Glad to see him back on form. I've been critical of his slump the past few years, but he's defnitely got the mojo back! As soon as you touch this limit, something happens and you suddenly can go a little bit further. With your mind power, your determination, your instinct, and the experience as well, you can fly very high. good to see the little man do well, although he needs to do better in races, as that is where Alonso is strongest and where you earn points. 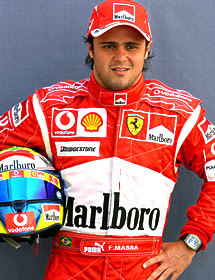 It would be excellent if Massa could challenge for the championship this season. It would be interesting to see how Alonso and Ferrari manage the situation should it arise. Hope he gets a win or 2 this year. Good to see you posting again, Dolomite. I agree that Massa is very under-estimated in his first career 2006-2009. Pleased to see his speed returning late in 2012 and continues in 2013. Or is Alonso driving with his handbrake on? Maaaaan, how much I wish that can happen somehow. 2008 was a season which I avidly followed after Kimi's triumph in 2007. Been a Massa fan ever since then...before that when he was at Sauber, he seemed like a spoiled brat when he showed DC his finger. Pretty close in 2007 too. Would be good to see him win, but by him and Alonso competing the way they are, it may be hurting the team. First race, Massa held Alonso up. Without that, Massa might have finished higher since he rather than Alonso might have tried the "undercut". 2nd race, Massa squeezed Alonso at the start, compromising Massa's position vs. Vettel in the 1st corner, and also Alonso. Without that squeeze, Alonso might have overtaken Vettel rather than crashing out, and Massa might have been 3rd. Good to see him not letting Alonso by like in past years, but unless the team wins, they both lose. And I think he cost himself positions as well. Im a Ferrari fan, and it did not surprise me that he came close in 07 or 08; I expected it. I think he has two options left to win a WDC. With Ferrari, he needs to beat Alonso. If he can maintain and steadily build up his points advantage over Fernando until, say, race 12, this could be done by Massa pulling out a win or two, and perhaps Alonso having bad luck at a race or two. Perhaps then Ferrari would say 'we will back you for the remainder of the challenge. Id say that this has a perhaps 1/10 chance of being the case. Then there would be a possibility that he could challenge whomever the over natural rival turns out to be. The other option is maybe if Raikkonen leaves to go to RB if Mark leaves, or McLaren if they hit the eject button on Perez. Lotus are the only 'top' team that i can see hiring Massa in a role that would not be a number 2 role. Lotus then turn out to have developed a killer car, and Massa beats Grosjean (or whomever) to the punch. Again, it is a slim chance, maybe slightly more plausible than the previous suggestion. It would be a huge story given how much he has been derided in the past few seasons. However, as has been mentioned, he has shown to have enough inside himself to to the business in a good car in the past. It would be a great F1 story.